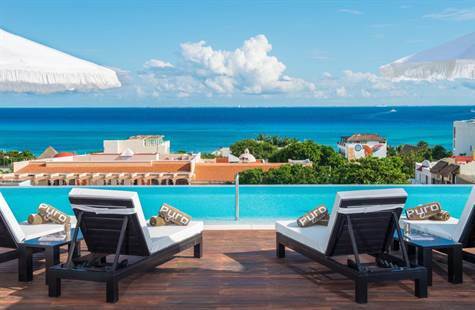 New Luxury Downtown Condo-Hotel for sale, Playa del carmen. New concept of full-ownership second home residences. It offers Loft, 1 and 2-Bedroom Residences with an excellent location and an exclusive Sky Lounge Terrace for owners. Enjoy a world-class level of quality backed by a renowned international hotel brand. Being strategically planned to operate as branded hotel luxury residences. Is located on 10th Avenue in the heart of Playa del Carmen, Mexico. Our coveted location places you just steps from first-class restaurants, luxury shopping and a variety of entertainment. You will be just one block away from Fifth Avenue, steps away from the beach and less than two minutes from the area’s three most important commercial centers: Paseo del Carmen, Calle Corazón and Quinta Alegría. Playa del Carmen is as liveable as it is lively, including convenience stores, pharmacies, grocery stores and a farmer’s market. Outside of Playa del Carmen, discover more of the Riviera Maya area, world-famous for Caribbean coastlines, cenote formations as well as the Mayan ruins in the ancient city of Tulum and one of the Best Golf Courses in the area.